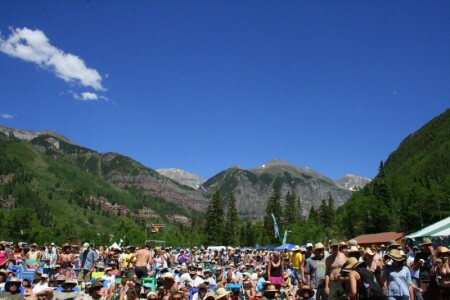 The Telluride Bluegrass Festival is a behemoth of goodness and gorgeousness. Nestled in the crevasse of huge mountains, surrounded by forests and rivers (I kept thinking of the Josh Ritter lyric, “The lake was a diamond in the valley’s hand” all weekend), it definitely wins for musical escapism. I spent last weekend at the 37th annual festival that brings a loosely-defined group of bluegrass musicians together in the mountains of Colorado, far from where the direct roads and highways go. Six or seven hours from the most populated areas of the state, it seemed like a wonderland when we arrived. I felt like a bit of an interloper, coming to the festival for the less-traditional indie artists with crossover appeal. I was absolutely there for the opportunity to see Josh Ritter and Mumford & Sons, each playing Nightgrass shows in teensy 250-person venues. It was an added bonus for me to see artists like Ben Sollee, Dave Rawlings & Gillian Welch, Alison Krauss, and the Court Yard Hounds (2/3 of the Dixie Chicks, who I forgot how damn much I used to like). I’ll admit I was unfamiliar with many of the other musicians, being fairly unsteeped in the bluegrass tradition, but interested to hear whatever I could absorb. After his set, I went to set up camp and I had gotten a parking ticket and didn’t even care. That’s what Josh Ritter does to me; careless disregard for parking laws and other mundane things of this society. I missed the Dave Rawlings Machine set while I attended to the necessary work of tent-constructing, but I heard the glorious strains of “Look At Miss Ohio” weaving their way to the campsite as I pounded stakes. 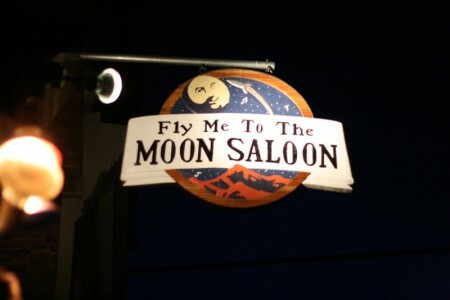 As the afternoon turned to evening, I walked over to the Fly Me To The Moon Saloon to interview Josh Ritter. You’ll hear more about this soon, but it was as marvelous as I had hoped. What a gem of a human being, as well as a songwriter and performer. After our interview and hugs concluded, I caught just a few songs of the heavenly-voiced Alison Krauss’ set back at the main stage (she really does sound that pure and untarnished in real life, and it is amazing). My favorite part of the set was probably “Down To The River To Pray” with Union Station — the bookend to hearing another song from the O Brother, Where Art Thou soundtrack at the Hardly Strictly Bluegrass Festival in California last summer. There’s something about bluegrass music that just sounds so right amongst the trees on a late summer afternoon. -getting to hear both “Wolves” and “Snow Is Gone” in the same set, songs that have meant a lot to me in the past year and just rupture beautifully live. -turning out every light in the house and singing an acoustic version of “In The Dark,” one that we all sang along to in near-reverence, and I cried like a girl with a skinned knee. Or maybe skinned heart. Finally, for the closing encore song, the whole band came out and stood arm-in-arm, next to Josh on acoustic guitar, and we all joined in to sing “Wait For Love (You Know You Will).” It’s the last song on 2007′s The Historical Conquests of Josh Ritter, and those closing minutes just overflowed with warm feelings — a mutual encouragement to us all. I was amazed for some reason at how everyone there seemed to know all the words, even on the verses. He certainly has created a legion of dedicated fans. The band left the stage and the crowd started to gather their things, but Josh closed with this, all by himself, hands clasped behind his back. It felt like a benediction. Friday started quite pleasantly, hearing the strains of Kentucky cellist Ben Sollee from the main stage as I toweled off from my camp shower ($3 in quarters for five minutes of hot water, a very decent trade). With my hair still wet, I meandered over to see him open the day with his plaintive, elegant, curious, articulate music. 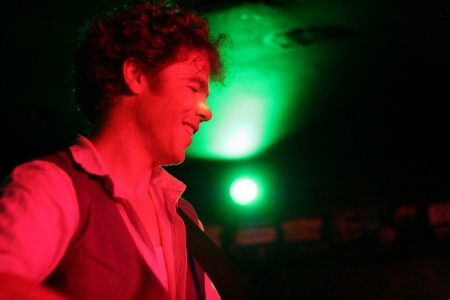 Ben had opened for Josh Ritter the night before, but I was so overwhelmed and out of it from the interview that I was glad for the chance to see him again clear-headed. 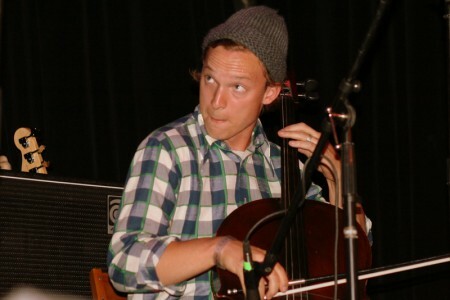 This extremely talented guy does wondrous things with a cello, an instrument I love. The resonance of a cello is swollen with sadness to my ears, like a lugubrious river, but Ben’s voice of clever levity cuts through it like a sharp speckled rock, parting the current. I have been listening a lot in these past months to his new album Dear Companion (Sub Pop, 2010) with Daniel Martin Moore (produced by Jim James and starring a few of those rakish These United States-ers), as well as his 2008 debut album Learning To Bend. 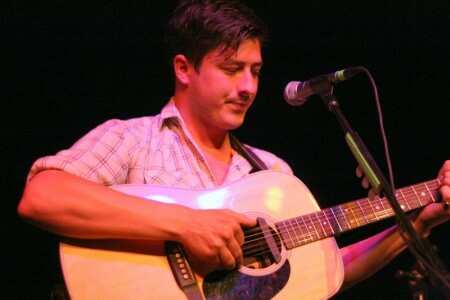 Ben’s songwriting is quick and intelligent, and he continues to grow marvelously as an artist. I highly recommend his music. After a few afternoon hours spent putting as much of our bodies as we could stand into the crystalline glacial river, while the bluegrass floated from the stage in the background, we dried off and headed in for the Court Yard Hounds. Sisters Martie Maguire and Emily Robison were back at the Telluride festival on the 20th anniversary of them first winning the band competition as teenagers, back before they became Dixie Chicks and ruled country radio. Three little girls stood right in front of me by the stage, all 5 or 6 years old, twirling and dancing in various tutus and wands and tie dyed clothes. I thought about what women they are for those girls to look up to, literally and figuratively. They were strong and confident, and I was drawn to the emotional rawness and feistiness on their new songs. After they finished, and I caught me some Lyle Lovett and his (no kidding) Large Band, it was Friday night, and it was time for the Mumford & Sons show. There is something primal and exceedingly honest in the harmonies and vocal melodies of London quartet Mumford & Sons, especially when you’re standing five feet away from their kickdrum that often provides the only percussion, and hits like a mallet to the sternum. I’ve loved them unabashedly since the first time I heard them, and I named their Sigh No More album one of my favorites of 2009. Telluride on Friday night witnessed their very first proper show in Colorado — and I imagine I will never again see a band playing their first show in a state where absolutely everyone sings along to every word, jumping giddily so hard that the floor bounces. The reception in that room blew me away, and led me to predict that this band will soon grow as huge in the States as they are in the UK, with as wide of an audience as their music deserves. I’ve had a really difficult time trying to figure out how to tell you all about this show. I was talking to my best friend Bethany on the phone yesterday, trying to articulate what it was that so confounded me, satisfied me, and left me speechless and breathless all at once. 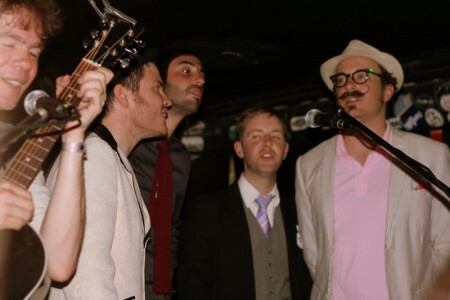 “There’s a memory in our blood of people singing together the way those guys do,” she mused. “It triggers something bigger and older than us.” I’ve struggled to write about their show because it was so intense and meaningful, and as I wrote earlier in the week, one of the best shows I have absolutely ever seen. Through a towering wall of power, their songs wrestle with love and grace, redemption and loss, struggling to be a better man — sometimes succeeding, and sometimes failing and burning. It’s the most relatable music I know of these days, on an acutely personal level, and seeing them blow the roof off live just about overwhelmed me in the best possible way. The basics: 300 people at a very sold-out show in the Sheridan Opera House, built in 1912 and still boasting the old warm globe lights around the stage, hand-painted detail on the balcony front. They started their set long after midnight with their four voices rising together for “Sigh No More,” quickly launching into “Awake My Soul” and an explosive rendition “The Cave,” then a huge new song called “Lover of the Light,” featuring lead singer Marcus Mumford behind an actual drum kit, instead of standing up and playing the bass drum while he strums. There was an ineffable joy and powerful hope rising up from the crowd – watch this video of “Roll Away Your Stone” from a few weeks ago in Los Angeles with the band The Middle East. I think we all felt like that. After “Timshel” and “Little Lion Man” (crowd went nuts for their big single), they did “After The Storm,” “Dustbowl Dance,” an older song “Sister,” and another new song called “Nothing Is Written.” A tremendous version of “White Blank Page” was their encore. After those lines about “tell me now, where was my fault / in loving you with my whole heart?” at about three minutes into the song, the instruments cut out and that stirring vocal interlude begins — man, you can’t write it, but it’s the “ahhhhh, ahhhhhhhh, ah ah ah….” part (see? words fail me). The whole room started singing, louder and louder, and the walls were soaking in it and vibrating as we sang. Then the band picked up the urgent higher harmonies, and it was the closest to church I’ve been in a while. I left their show feeling so thoroughly sated and completely without coherent words, which is rare for me who always has words, and lots of them, for most occasions. I stayed behind to shake each of the band member’s hands, just so I could say “thank you.” Just a simple, heartfelt thank you for what they just put me through, and for the seams they ripped open and then helped mend. All my receptors were vibrant and content. Walking home from that show at 2am on Friday night still glowing, I passed Ed Helms again, playing banjo on a street corner jam session, then a few blocks closer to the campsite I came across (pretty sure) Peter Rowan calling impromptu square dancing steps while playing the fiddle to a roiling flailing bunch of colorful folks while the cops looked on, bemused with arms crossed. I tilted my head back at the ten million stars, a sky so dark I could see the bands of the Milky Way, and crossed a footbridge over the singing river to my campsite. Someone had left glow bracelets and glowsticks scattered in the inky blackness to help me find my way home. Welcome to Telluride. I smiled, and was very very happy. Tagged with alison krauss, ben sollee, concerts, david rawlings, gillian welch, josh ritter, mumford and sons, telluride. I completely understand now, that was more than I imagined. Thank you again for capturing and expressing what can’t fully be explained, but merely needs to be experienced. Dang. More than the songs & bands you reveal, I like the way you describe them – even when you feel you don’t have the words, you get across the feeling & spirit of how they affect you and that’s really what it’s all about. 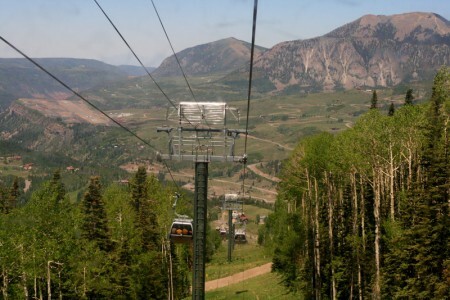 Your Telluride update make me feel as if I were there, only without sleeping on the ground. Thanks! 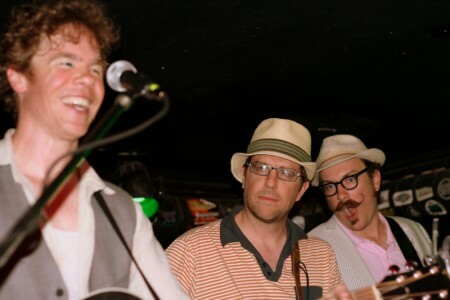 ps – I can’t believe you were there but missed Dave Rawlings…doh! Thanks for sharing. It’s nice to know someone else out there is so moved by music that tears aren’t all that uncommon. 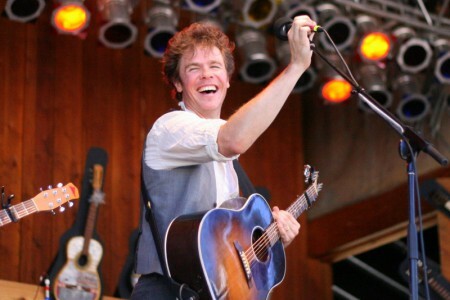 Is there any way for those of us unable to attend the festival to hear recordings, specifically of Josh Ritter’s “The River” cover? Just typing that makes me happy. ‘The River’ live is one of the best moments I have ever seen. He played it here in Chicago and the entire theatre was completely silent. It took a few seconds after he finished for all of us to compose ourselves, catch our breath, and clap. I have a really nice mp3 of a previous performance, and I like it a lot, but it doesn’t do it the justice that seeing him do it live does. Absolutely amazing. aw shucks, I’m quoted! this post filled me with even more longing than hearing the words first. i want to go to this with my dad next year. this would be my heart’s festival. thanks for the link to the mumford & sons videos from dallas! i was at that show and wanted to throttle all of the people videotaping it because they were blocking my view, but i guess it’s nice to be able to hear it again. the festival sounds like it was amazing…i’m jealous of all the great music you got to hear! I waited outside a Josh Ritter gig a few months ago after being told over and over again by grumpy venue staff that he’d gone home. When he did finally appear to chat with those that had bared the cold Cork night to wait for him, I was rewarded by the most satisfyingly wonderful hug a heterosexual man can receive from another heterosexual man. Not only is he an incredible performer and songwriter with a saintly personalit, my goodness that man can hug. Thank you so much for a beautiful write-up on what sounds like an absolutely stunning festival. I’m a huge fan of all types of music but I have to admit that I was slow to appreciate the genre of bluegrass. 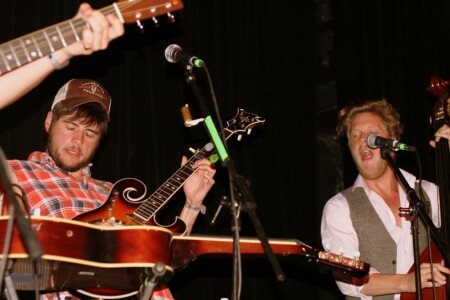 I have two young sons and their enthusiasm for The Avett Brothers and The Punch Brothers has led me to seek out other great bluegrass musicians. Thanks to this post, I have a better idea of which bands to check out. A quick tip: being a stay-at-home dad, I often browse around Bandcamp looking for free and pay-what-you-want albums and I found a really great bluegrass band called Greenland Is Melting. These three guys from Gainesville have made an incredible album called “Our Hearts Are Gold, Our Grass Is Blue” that has become my soundtrack of the summer. It’s heartfelt and rollicking and wonderful. If you get a chance, check them out and let me know what you think. I loved your review. It is so much better than reading some generic review because you let your personality come through in a way that keeps it interesting. Thank you for sharing it with us. I can’t wait to go next year. I lived in Denver for five years and this is the perfect event to base a visit around. Even though i really liked your bit on Ritter(I’m a big fan)and Girl in the War is amazing) this entry made me very nostalgic and wanting to go to a music festival. 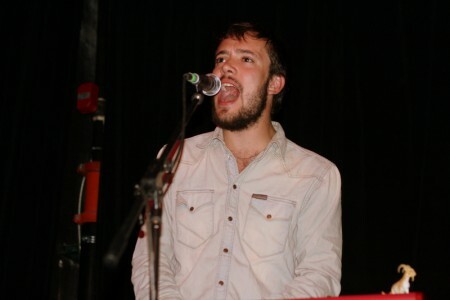 I am now convinced that we are musical kin and should never doubt your judgement. Based on this write up I bought the Mumford & Sons album and its completely blew my mind. The opening track, Sigh No More, are all lines from Shakespeare’s Much Ado About Nothing (one of my favorite things EVER) so with the banjo and the beautiful earnest singing, I’m completely hooked. Josh R did an in-store here in Portland…he played beautifully for almost and hour…smiling the whole time….I could see him once a month for the rest of my life! Beautiful post, Heather. Here’s a fun video of Mumford & Sons rehearsing in Telluride for their main stage set with special guests (and bluegrass greats) Jerry Douglas, Sarah Jarosz, Cadillac Sky and others. Their unforgettable final encore of “Hey Jude” was capped by legendary drummer Omar Hakim running out to play the final singalong chorus. It was pure Telluride magic. That is really terrific, Brian. Thank you again, so much, for your fine hospitality in Telluride. Absolutely magic indeed.